At Alvi Armani, our FUE hair transplant is a simple, outpatient procedure that has eliminated the customary linear incisions and stitching of the out-dated FUSS procedure. This minimally invasive process has significantly reduced the pain and healing time involved, and patients are able to return to their daily routine much faster than the traditional strip surgery. Your day begins by meeting with your Alvi Armani physician to discuss your specific goals and the plan for your procedure. This involves a detailed breakdown of the zones that will be restored towards achieving your desired look. The next step in your procedure is the extraction of the donor hair. This is a key step that distinguishes the revolutionary Follicular unit hair transplant procedure from the out-dated FUSS hair transplant. Unlike the FUSS procedure, which involves cutting a strip from the donor area to harvest the grafts, the Follicular unit hair transplant method requires no such strip removal, as follicular units are removed individually from the donor area. This results in a significantly shorter healing time and minimizes any pain. As well, there is no linear scar along the donor area as is characteristic with the FUSS procedure. A follicular unit hair transplant is a natural grouping of hairs that grow together in the scalp and share the same blood supply. Each follicular unit has from one to four separate individual hairs growing from it. 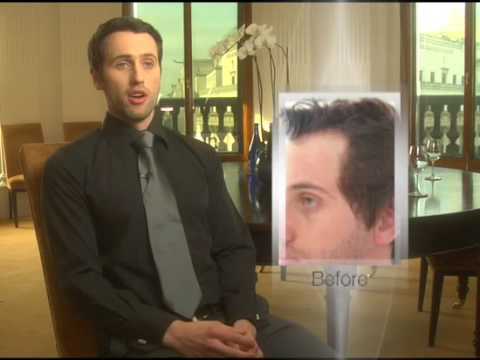 Follicular unit hair transplant yields the most natural look and highest density, as it involves the extraction of units from the "donor site" at the back of the head with surgical hair restoration technique, where hair is genetically programmed to grow for life, and then implanting it in the areas suffering from hair loss. After all the grafts have been harvested from your donor area, we move on to the step of preparing the recipient sites - that is, the areas that will be receiving the new hair. Your Alvi Armani physician prepares each graft site by making tiny incisions where the follicular units will be inserted with follicular unit hair transplant. Alvi Armani takes great pride in ensuring each donor follicle is perfectly placed, bringing together a complete unit of natural flowing hair. The strategic positioning of hair to match each patient's individual, natural growth pattern is a key factor in achieving a truly undetectable result of FUE hair transplant. Once the recipient sites are complete, it's time to place the grafts. Under the direct supervision of an Alvi Armani physician, our surgical staff begins placing each graft, one by one, into the donor sites. Our surgical staff is composed of dedicated technicians that are hand picked and personally trained by Dr. Antonio Armani, ensuring that each patient's grafts are handled with the utmost care to ensure that each patient achieves the results that have made Alvi Armani leaders in the FUE hair transplant industry.